Besides natural landscapes, Phu Quoc is also well-known for its historical and holy sites. 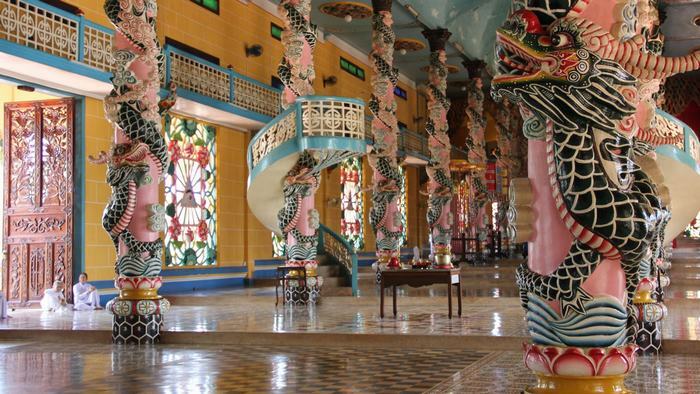 One of the most famous worships here is Cao Dai which you should discover once when taking a Phu Quoc tour. Phu Quoc is the declaration of the general director Dao Tam Ky Pho High – Cao Dai. 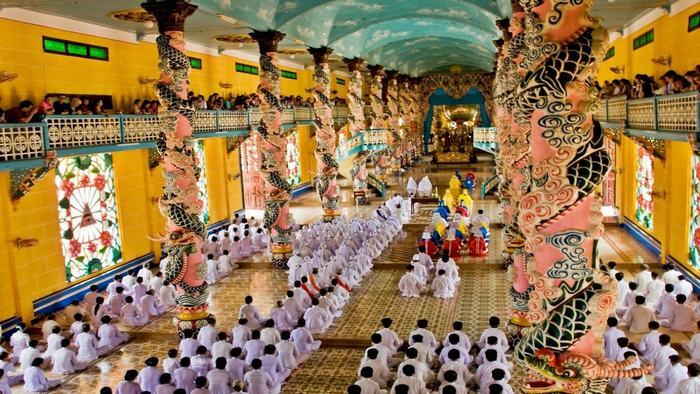 As a monotheistic religion, with the fusion, Cao Dai is a direct compromise between Buddhism, Christianity, Taoism, Shintoism, Confucianism. Religion was established formally in tiger (1926), but from six years ago there was a person who Cao Dai worship: that he was Director of Phu Ngo Van Chieu, then his accomplice in the Second Division of the Government to the Governor Cochin. Mr. Phu Ngo Van Chieu born on 28-2-1878 at Binh Tay (Lon) in a small house behind Quan De Pagoda. Capital is very smart, good at learning time, the very first worship the gods. He started his career at the Department of Immigration officials in Saigon, working through three years from 1899 to 1902. In 1902, where now the established requirements in Thu Dau Mot, he came almost now, a Great First Christmas now revealed to his religious mission and that encouraged him early in Religion. As Chief Administrative District in Phu Quoc in 1919, he lived a life of gentle faith in accordance with strict rules of Taoism. He used to hold the bridge now Korea, received the teachings necessary for spiritual evolution. Among those who are in contact, who is a self-proclaimed “Cao Dai” special concern to his Government Chieu. At first, the name was astounded those present, because there is no religious book of this record. However, his Government recognized that it is Chieu nickname of God, because by the revelation and the teaching philosophy at a high-level meeting where he led several times. Mr. Negative Chieu Cao Dai permission for who he has worshiped him as a form of authentication and ordered him to be represented by an eye as his symbol. It is the introduction of the first Cao Dai followers in the new religion and this religion was founded six years later in Saigon. Soon after, he changed the Government Chieu capital Saigon, where he persuaded some people to believe the new direction and joined the director. Currently in shrines Cao Dai Duong Dong, Phu Quoc has a large stone slab, is engraved the words “Chieu district,” the respect due to Mr. Ngo Minh Chieu carved. The tablet was considered relics excavated. This is how the Cao Dai who recruited the pupil. In mid-Ox Yi (1925), a small group of Vietnam signed the poems from much different professional administration in Saigon, every evening pastime by the invisible communion with the divine word school. They use the “desk type” (table frappe). The first test did not result. But with patience and persistence capacity, they achieve positive results. With these questions for the selected components, or poetry, or prose, they get the answers surprising. Parents or friends of their late epiphany to tell them what the family and also advised them to forget their sacrifice. The findings are thrilled to help them recognize that the existence of the mysterious world. However, there is a spiritual fellowship who was remarkable for his kindness and the teachings of his ethics and philosophy at a very high level. In him in the name was “AAA”, do not want to know about him, despite the prayers of those who attended. After that, the poetry he signed another Vietnam to join as a group more numerous amateurs built the table. The First Forum was held May more serious and more regularly. Because the use of the “desk type” is not convenient, so divine beings told to replace it with “Jade body.” With Jade engine, the one who can write letters directly, the mass is naturally faster and pupil support the more tired old town. 24-12-1925 On the occasion of Christmas, divine beings led so long, still, insist on keeping anonymous, now shared with the town, to Him who is God under the name of Cao Dai to feet of teaching in Vietnam. Since then, the one who instilled the Tan Cao Dai faith to the believers. This is the election of the first part of the reception of Holy Languages (spiritual messages). Hope that with this article, you will have a clearer look about Cao Dai Holy. If you concern more about what to do in Phu Quoc, please visit our website. Do not hesitate to contact us if you have any questions. Have a nice trip!